lists & snapshots on any device. How it's used: Captures raw ideas like a shoe box full of paper scraps. But unlike a shoe box, your Keep-captured notes are cloud-synced, updated and searchable across all your devices. Always got your smart phone nearby? Then you are always ready to capture that creative insight with Google Keep! 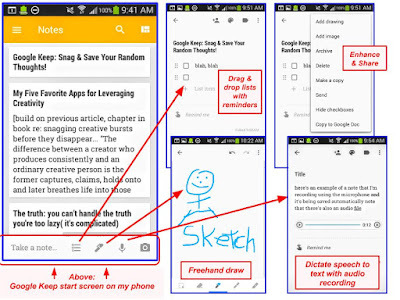 Features: Snag your ideas in the form of text notes, dictated audio snippets, screen-drawn sketches, checklists, camera-based direct-captured photos or gallery-inserted photos. Whatever media form your inspiration takes, Keep helps you save it effortlessly before it evaporates. Each item you save can be tagged, color-coded, enhanced with scheduled reminders, shared among team members and more. 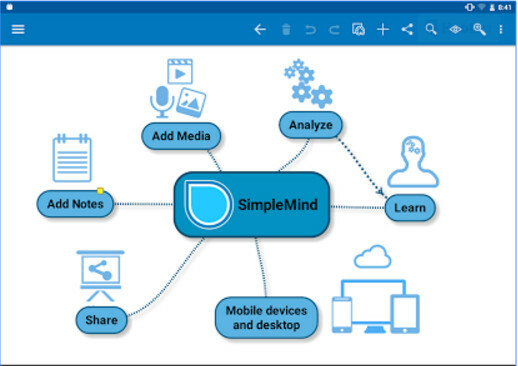 SimpleMind: Mind mapping & brainstorming on any device! How it's used: Creates conceptual "mind maps" (networks) of related concepts, idea flows, people, places or things. (Learn more about mind mapping here.) Mind mapping can be a powerful way to help you brainstorm and visualize complex topics without prematurely locking in ideas like you might if you're using an outline or list. And because the ideas seem more "raw" or fluid, you can easily invite others to participate playfully in team brainstorming. Features: Start with an empty screen on which you can drag and drop blank, pre-formatted network nodes (a fancy word for "goofy little bubbles"), label them with text, draw lines between them to show relationships, add images and lots more. It's sort of like you're creating an org chart or a flow chart, only it's a more fluid and relaxed a process. You can assign colors, change chart structures and make other enhancements to help bring order from chaos via visualization. 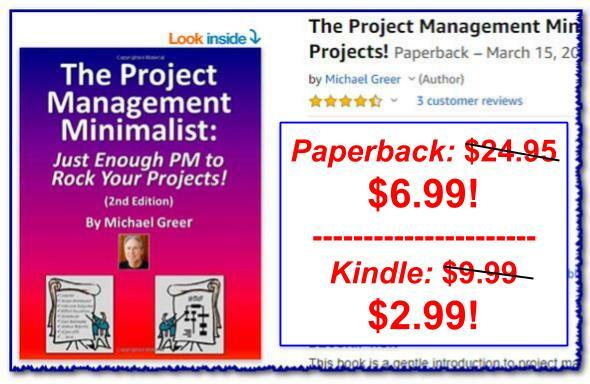 SimpleMind too pricey for you? 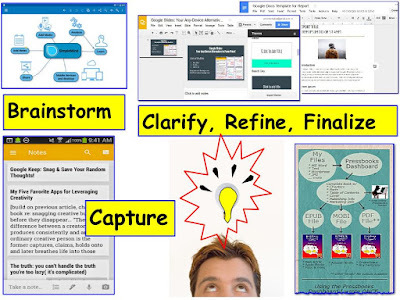 OK -- To create mind maps and keep them in the cloud for free, consider using the shapes, arrows, and other tools available in Google Slides or Google Drawings (described below) or check out MindMeister. A Bonus Mind Mapping Tool: MindMeister! 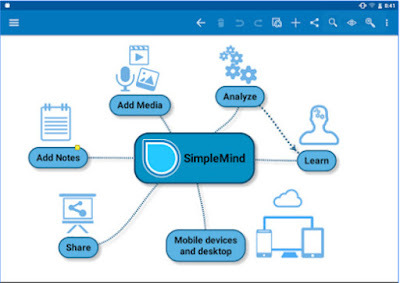 MindMeister is an excellent free, all-platforms alternative to SimpleMind. It has lots of formatting tools to create good-looking mind maps. Your free MindMeister account allows you to create and save up to three maps to the cloud. (Though you can always delete an old map so you can make a new one and stay within your quota of three.) Saved maps can be shared for collaboration and exported as PDF files or PNG/JPG image files. MindMeister has a Chrome browser extension, an Apple iOS app and an Android version. 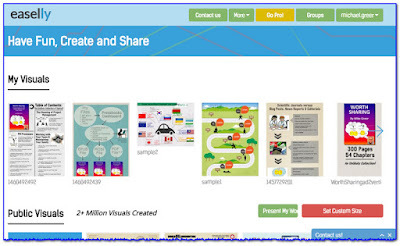 Learn more and take a test drive at the MindMeister website. Features: As feature-rich and easy-to-use as Microsoft's PowerPoint, it's loaded with pre-formatted shapes, fonts, layouts, templates, etc. And you can easily add your own photos, graphics and text to help summarize your ideas and create a powerful single visual or multi-slide presentation. Exports PDFs and several other graphics formats. 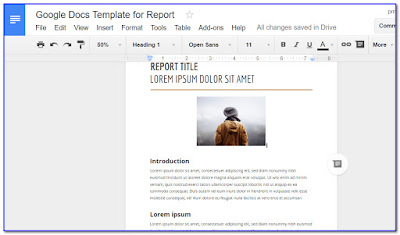 using Google Docs on any of your devices. 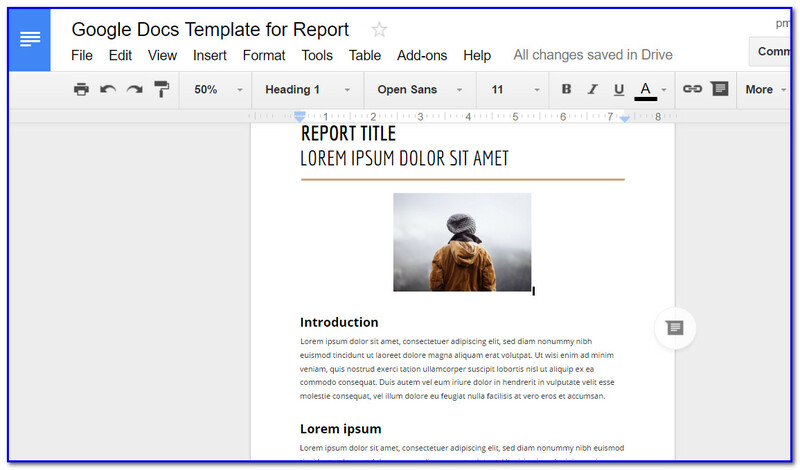 How it's used: Google Docs is my multi-platform replacement for MS Word on my PC. It's all about helping you write articles, reports, web pages, brochures and more. Use it to create drafts, then polish and finalize the finished product. And use it on ALL your devices for FREE. Features: It's a high-powered word processing app that has everything you need to go from rough draft to beautiful finished pages that include tables, graphics, multiple fonts/columns and much more. that help explain complicated ideas. Features: Includes lots of user-created examples, templates, graphic dividers & arrows, enhanced background patterns & colors, shapes, fonts, and much more. 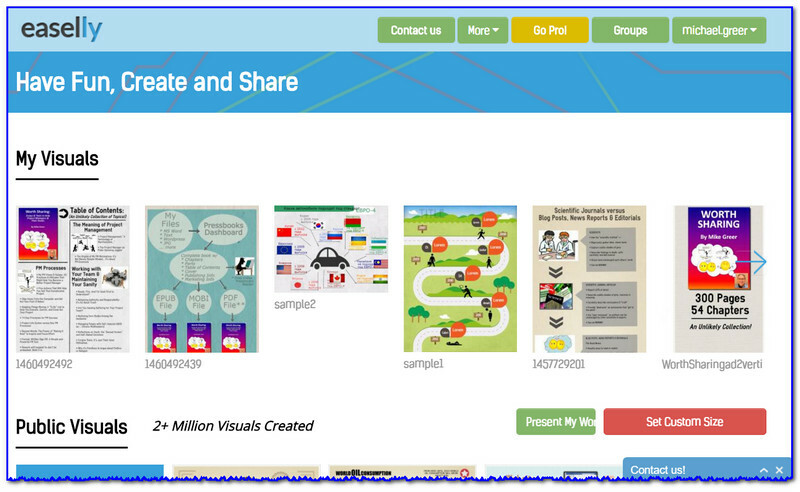 Export your infographics or link to them so they can be shared (and hosted) by the easelly website. 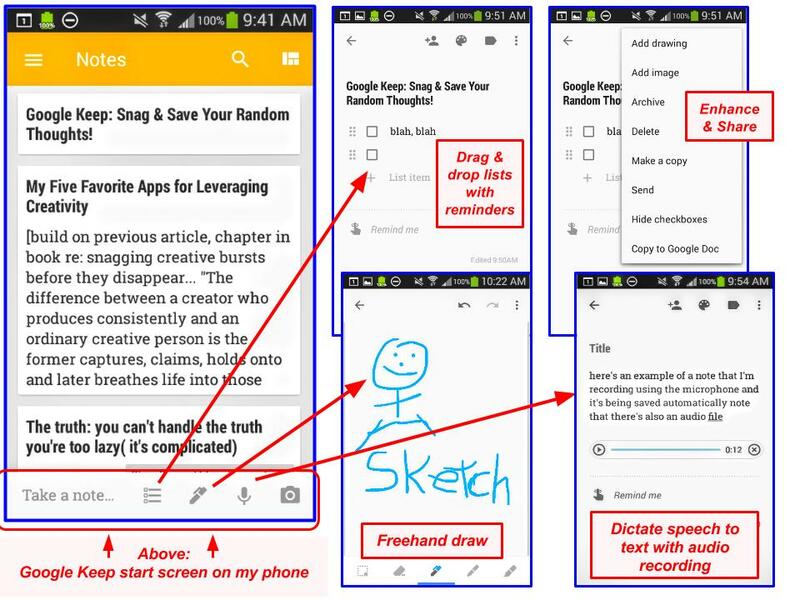 Before Google introduced Keep, I used Evernote as my "go to first" tool for capturing rough ideas. And Evernote remains a cross-platform powerhouse for note taking, collaboration, capturing and organizing research documents, photos, etc. However, since Keep feels like it's lighter weight (it seems to load more quickly for me) and has a simpler user interface, I have gradually come to use it more than Evernote -- especially in the early stages of a project. You can learn more about Evernote through the many free video tutorials that support it. See my "Video Tour: Evernote's Buried Treasure... Video Tutorials!" Step Away from the Computer & Get Out Your Post-It Notes!